Andax offers all the sock and boom configurations you need for any contingency. Our Mini-Booms surround and contain any spill, while our Sorbent Booms serve to clean oil or chemicals from waterways and contain larger spills on land. Andax’s Original Sorb-Sox™ are always handy to contain an active spill or to place around leaking equipment to prevent slip and fall hazards. And Spyder-Sox™ prevent spills from contaminating drains by absorbing spills fast and permitting only water to pass through. Andax continues to provide you with sorbent options for every application. Our sweeps work great for marine and waterway cleanup, while our pillows work just about anywhere you want them to. 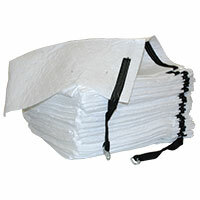 Don't forget Andax's loose absorbent and Drip Shield™ are also available.